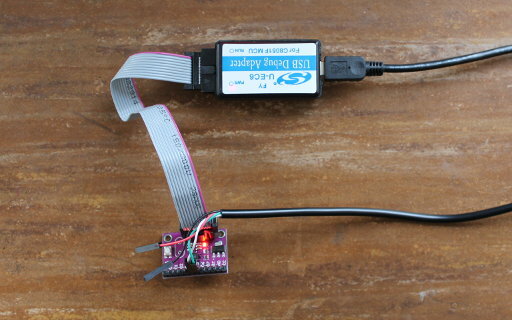 This short tutorial presents a simple "Hello World" program for the C8051F300 Development Board Module, with an extra Hobby Components HCCABL0015 USB to RS232 TTL Serial Interface Cable. Boards are widely available via different channels. The one used here was bought on ebay. The author used a Debian GNU/Linux system, but the tutorial should work for other Linux distributions, *BSD or other Unices. The C8051F300 Development Board Module is connected to the host computer via a U-EC6 to supply power and to write the demo onto the board. For serial ouput we attach the serial interface cable (white to P04, green to P05). Assuming the board is connected to a U-EC6 attached via USB, ec2writeflash --port USB --hex serial.ihx --run will write the demo onto the board. You can see the "Hello world" using a terminal program configured for 9600 baud, no parity, 8 bits, 1 stop bit and no flow control.